Time flies when you are on vacation time! We’ve seen much and have put 2800+ miles under our butts! I think this will go down as a “scouting” trip as there are places I passed that I really need to go back to…yes, need to! I made it to Douglas Wyoming by gosh! I will have to say going through Wyoming is akin to going through Kansas. Mile after mile of field and rock. We have yet to see a buffalo! But we continue to say that the buffalo are disguised as cows, rocks and even the occasional tree…at one point I could have swore one was hiding out in an oil well costume! We’ve had to try to be creative, can’t you tell! It was a long drive across Wyoming. We finally made it to Colorado Springs, I believe, on Saturday. My uncle Max has been a long time Colorado resident. He lived in Aurora for many years, in an apartment without modern conveniences like a phone. He always used the pay phone down the hall to make calls. 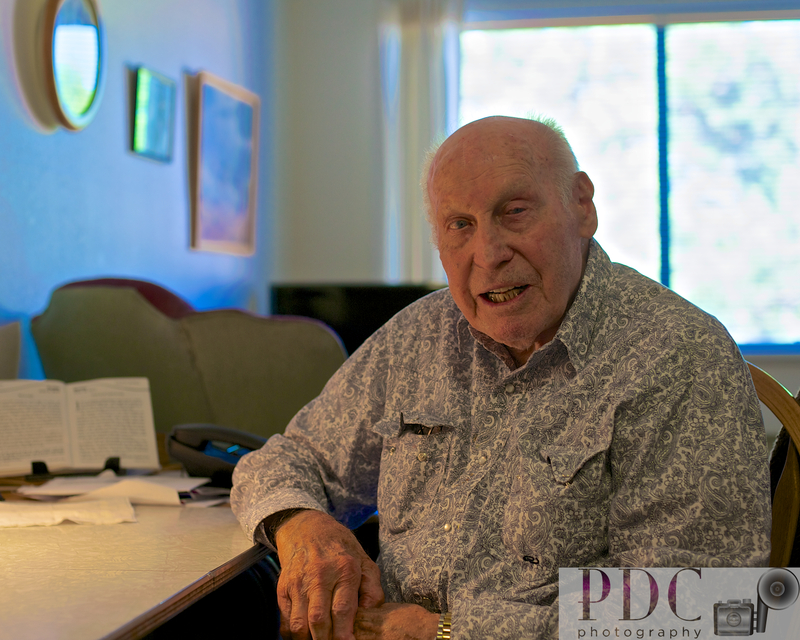 When he retired he purchased his girlfriend’s brother’s property in Deer Trail, Colorado…he had to have utilities and when he went to connect his phone he was asked when he had a phone last…in the 1950’s when he lived in Illinois! Fast forward to the present…my uncle Max is 95 years old and his girlfriend Lela is 98. They live in assisted living apartments down the hall from one and other. I was able to spend time with uncle Max. He is still sharp as a tack mentally and so is Lela. This is my favorite photo of uncle Max. He is smiling; I’ve never photographed him smiling! 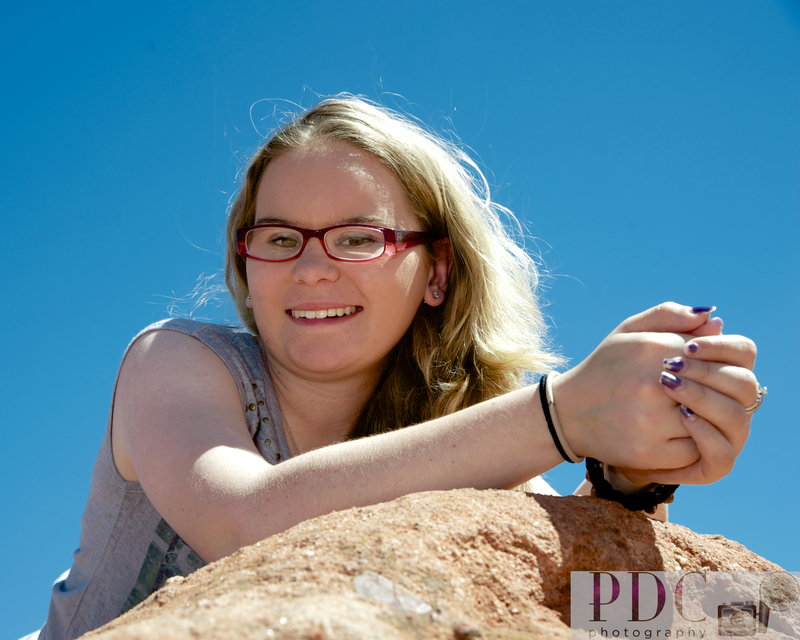 While in Colorado Springs, my daughter and I went up to the Garden of the Gods and did a few senior photos. I did not feel well that day. Between the heat and the altitude I think they got the better of me. I always like going to the Garden of the Gods. I would like to visit it in late spring or fall when it is not so hot out. Monday was a travel day. I decided to go half way to Flagstaff Arizona, stopping in Cortez Colorado. 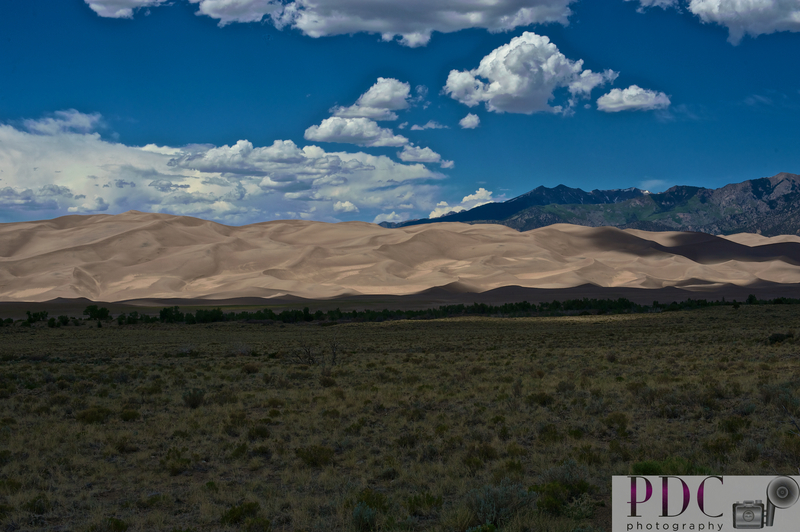 We stopped in Alamosa County in Colorado and payed a visit to the Sand Dunes National Park. I am so glad I purchased a park pass…it has more than paid for itself! This was the first mountainous area I traveled through pulling the camper. Traveling Rt 160 while very picturesque, I was not prepared for the 8000 feet in altitude and the ascent and descent that lasted 8 – 10 miles each way! What goes up must come down you know! I had to watch my temperature gauge as it crept up. I found if I lifted my foot off the gas it helped a great deal. It also made me nervous at times when the engine revved to over 5000 RPMs. I would back off again and still it did fine. I made it through the mountains…very carefully! I took it easy on my brakes too! My car has a “gear down” feature and all you do is push a button and it saves a great deal of braking! My one friend says I have a “jake brake” on my car. Whatever it is, it works very well! 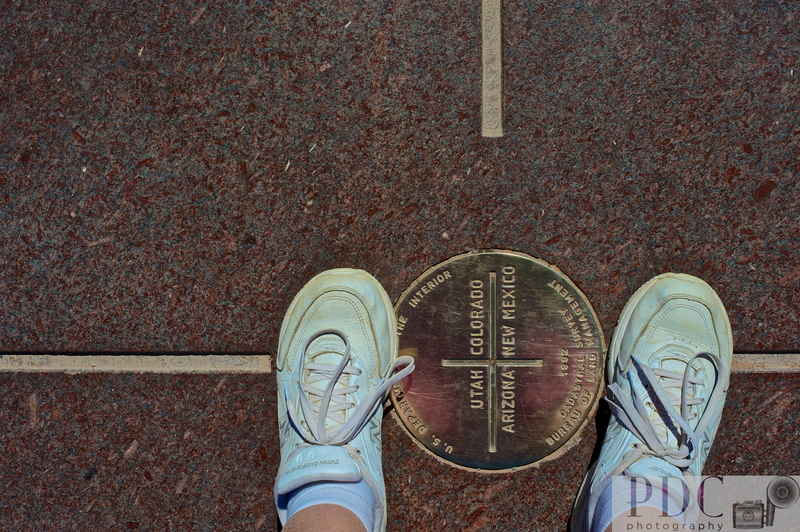 We traveled on into Flagstaff today, stopping, of course at the Four Corners Monument. 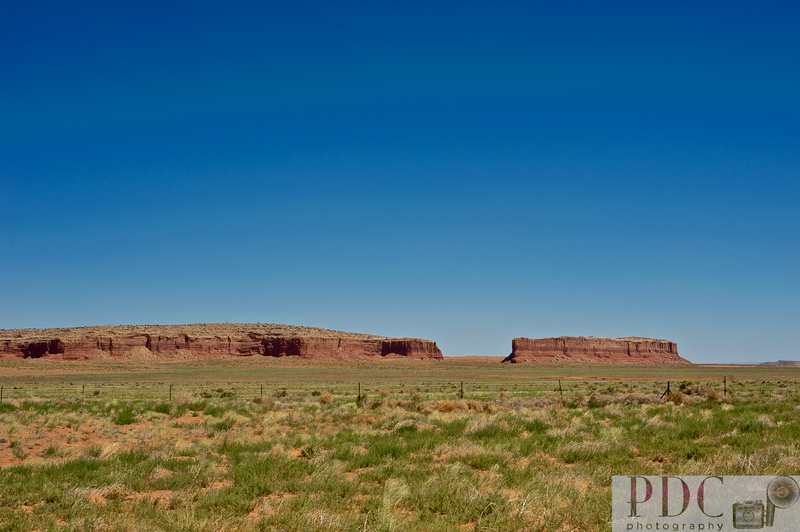 On our way to Flagstaff I saw a few interesting rock formations. For supper tonight I decided to use Yelp* to help me pick a place for dinner tonight. 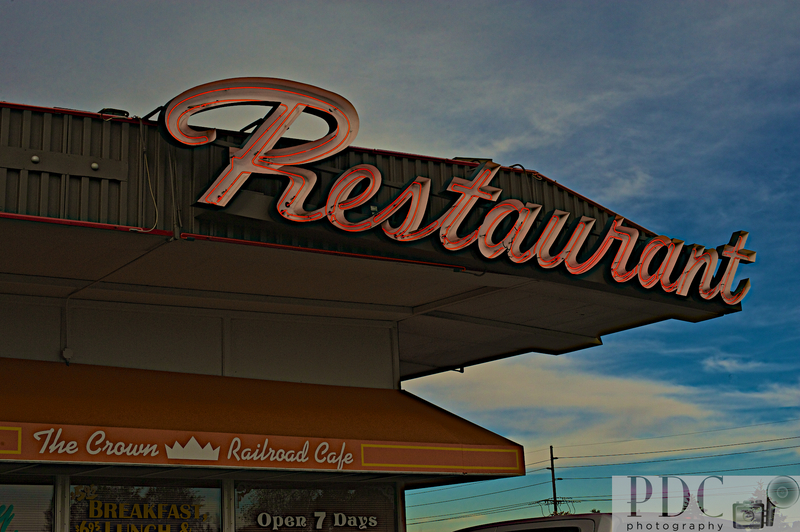 I chose the Crown Railroad Cafe. After circling the block a couple of times I figured I’d give it a try. The outside pretty plain except you see the nifty neon Restaurant sign on top of the building. The restaurant is attached to a Howard Johnson that is being remodeled and there are dumpsters in the parking lot. I figured what the heck! Yelp* gave it 4 1/2 stars. The place was very clean on the inside. Reminded me of Mel’s Diner on Alice. It had a model train circling the dinning room along the ceiling. The waitress recommended the burgers and what a treat! Loved it! I can hardly wait to try other local flavors while traveling the area and on the way home via Route 66! If I was Guy Fieri I’d visit this place. A real Diner, Drive-in and Dive! Great Burgers! Tomorrow is the Grand Canyon. I think I will travel there in the evening to catch the sunset. Such pretty colors I saw tonight! It’s been a few days since I’ve written about my trip. I’ve taken a lot of pictures and spend most of my evenings editing and trying to hold my eyes open! By the time I finish going through my photos, I’m ready for bed. My dogs have done very well during the trip and today the saw Mt. Rushmore with us! 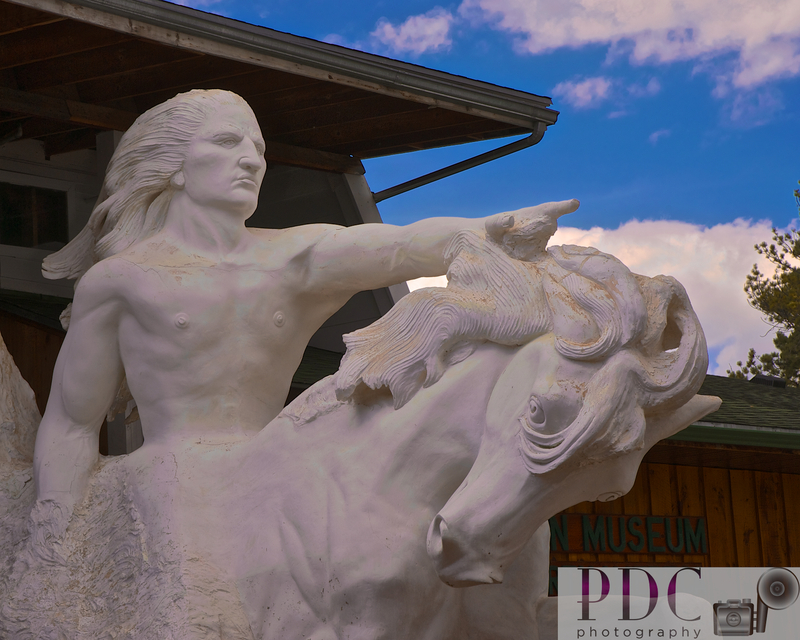 During the couple of days at my cousin Bruce’s house we went into Yankton South Dakota and explored a re-creation of the town’s buildings and a nice little museum. 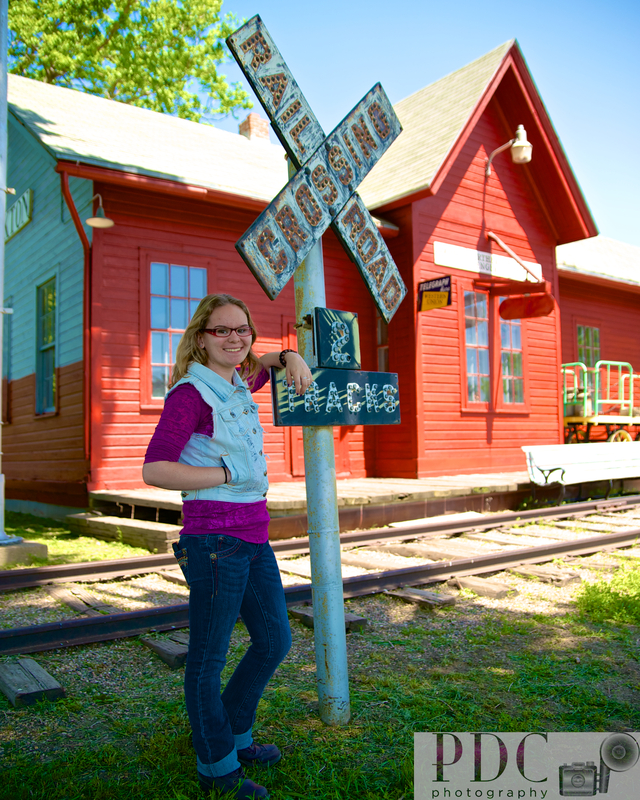 I started senior pictures for my daughter and we did a couple at the old railroad area…a memorial to my dad who was a railroader. Libby and I tried Taco John’s — not a bad little fast food place. We were served in Wendy’s cups so I assume there must be a relationship with them. We went to the riverfront to see the Missouri River. It was so windy. After we got back to the house, Bruce decided to take us for a ride on his Harley. I, personally, am not a motorcycle person. I decided to take the ride and I had a nice time. I just worry about the other people. There is such a disregard at times for motorcycle riders. I had seen a fatal crash as I left for my trip last Friday. I saw the guy laying on the ground…that is all I’ll say. 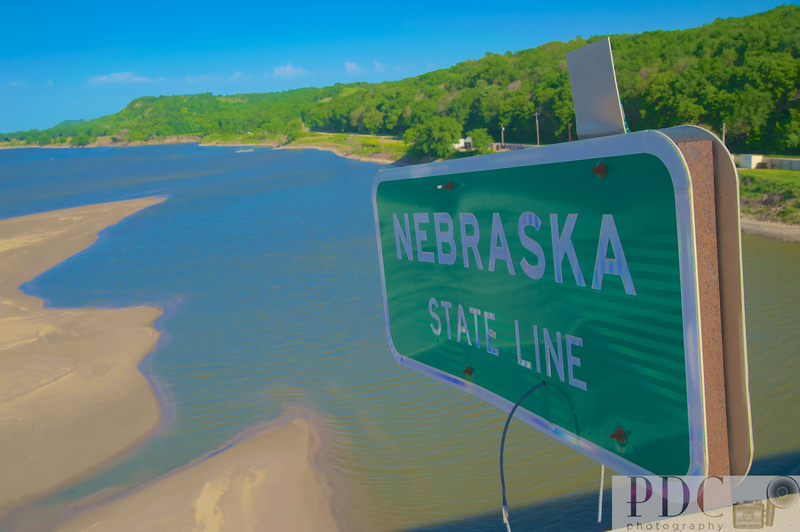 During our ride we crossed over into Nebraska over the Missouri River. Bruce told me that all the sand came in with a massive flood that hit the area a few years ago. We then took an evening drive into the country where we were educated in how to spot wild asparagus from the car and how to avoid badgers. We did see a badger and we did gather wild asparagus. No drive in the country is complete without the random deer running across the road in front of you! I spotted it and screamed, then Ruth screamed…we missed it. 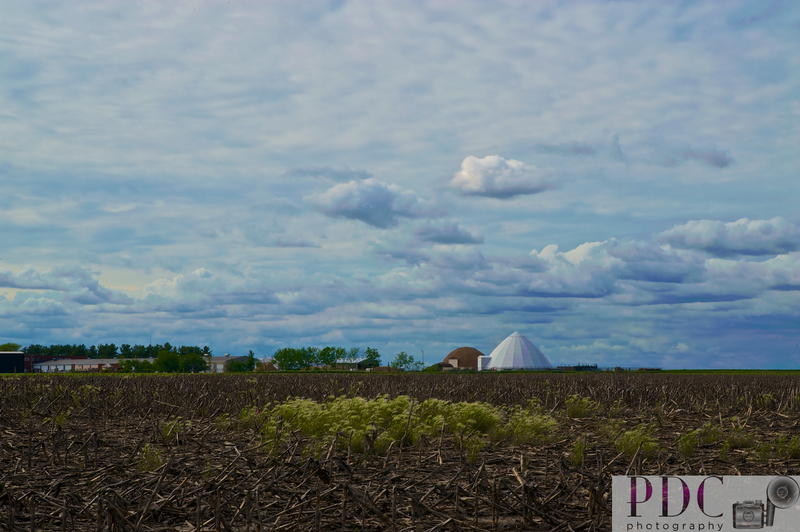 I took a few photos of trees and old barns. I’ll have to work on them more before posting, but here are a couple I like. 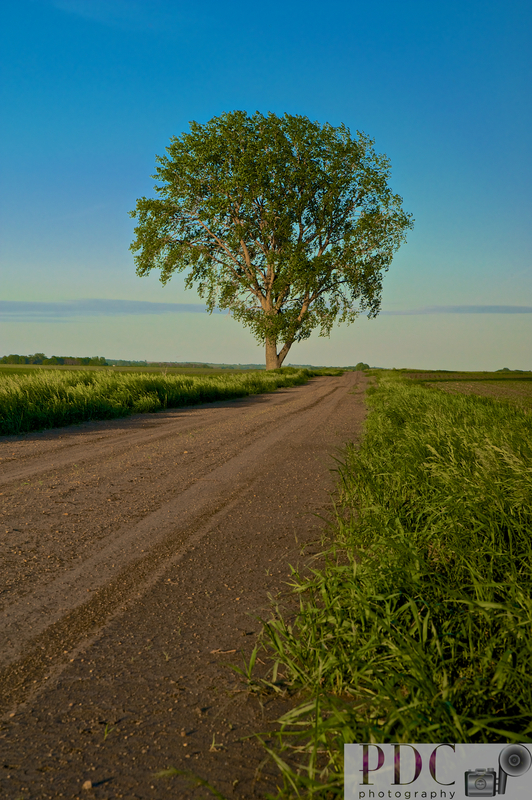 I really like how the tree and the road turned out. This is a typical South Dakota view. Land and more land! 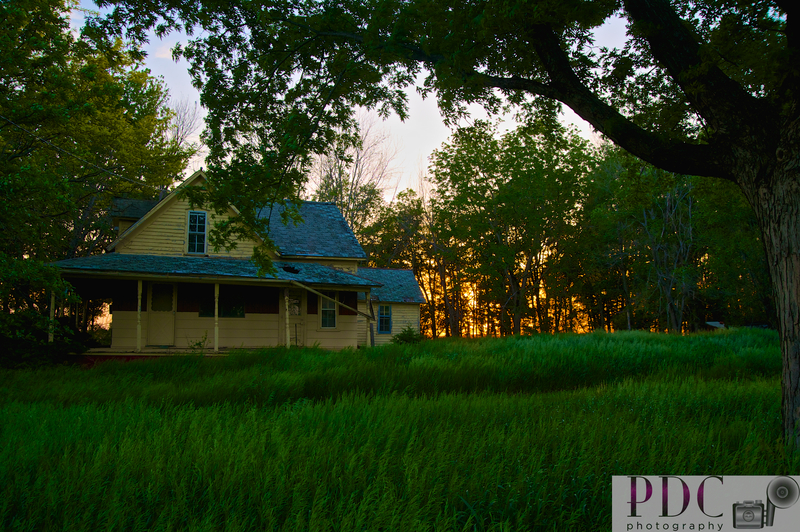 This was an abandoned farm. We walked around and took a few shots of the buildings. As we rounded the one corner, we heard something very large move around in the barn. I did not wish to hang around to see what it was! 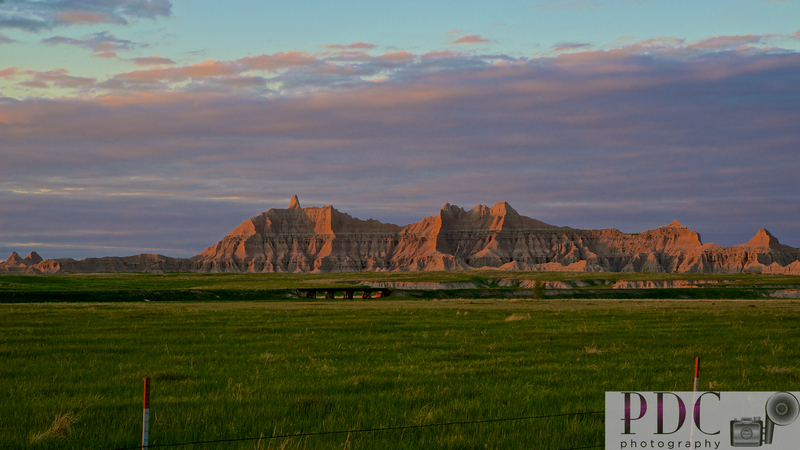 We left Tuesday morning on our journey to the Badlands. We arrived there around 7:30 pm mountain time! All I can say is WOW! I was not prepared for what I saw. 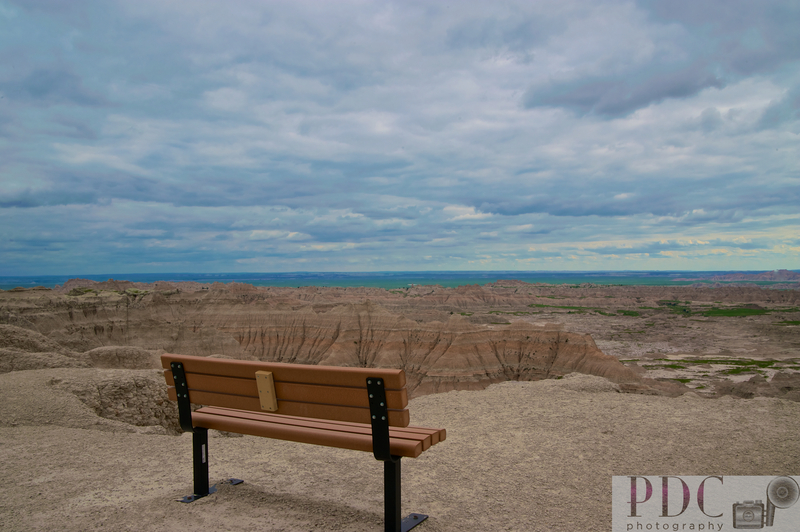 We stayed at the Badlands KOA. They have a dog park there and the dogs really enjoyed running around in it. We did make a stop at the Corn Palace on our way to the Badlands. We have seen mountain goats, prairie dogs, coyote, and antelope. We keep looking for Bison, but all we have seen are cows…or are they bison in disguise? This mountain goat was grazing along the side of the road. I was photographing a herd on the side of the mountain and I heard a couple next to me say, “Oh, my!” The told me to turn around and look…it was a couple of feet from them and they were not aware of it even standing there. 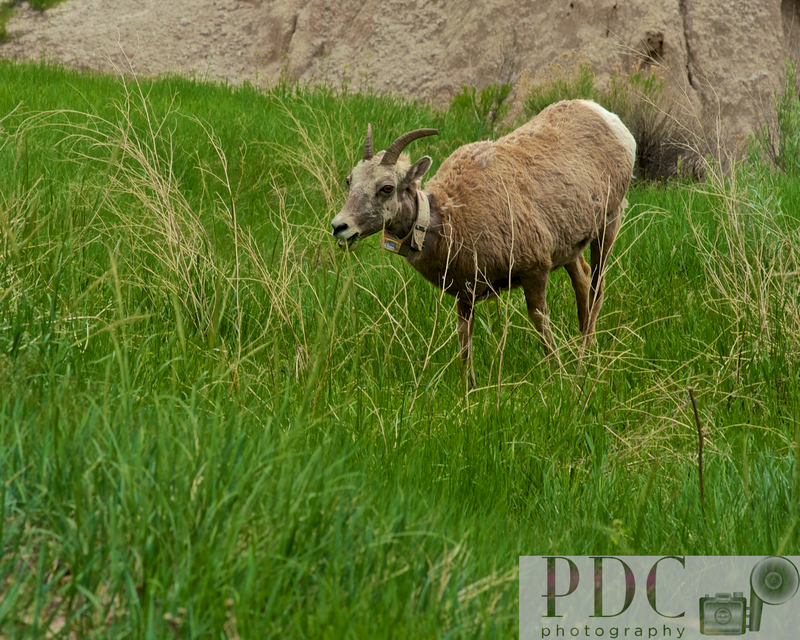 Libby and I kept our distance but managed to capture several nice shots of it while it grazed. 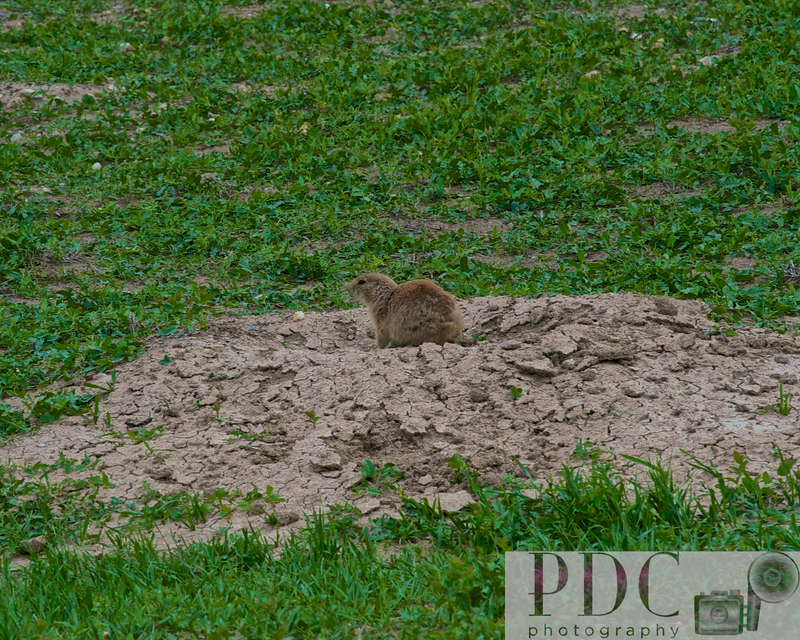 The prairie dogs were very noisy and skittish! The mountains here in the Badlands are interesting. I enjoy just driving around and marveling at how they are unique and just so special. The millions of years of erosion to create the spectacular view. I wanted to create a special sunset view with the colors reflecting off of the rocks. We made the trip up to Wall and saw Wall Drug. We had a buffalo burger…it was a tad on the dry side. It was good, but I’d like to try one again that maybe was prepared differently. 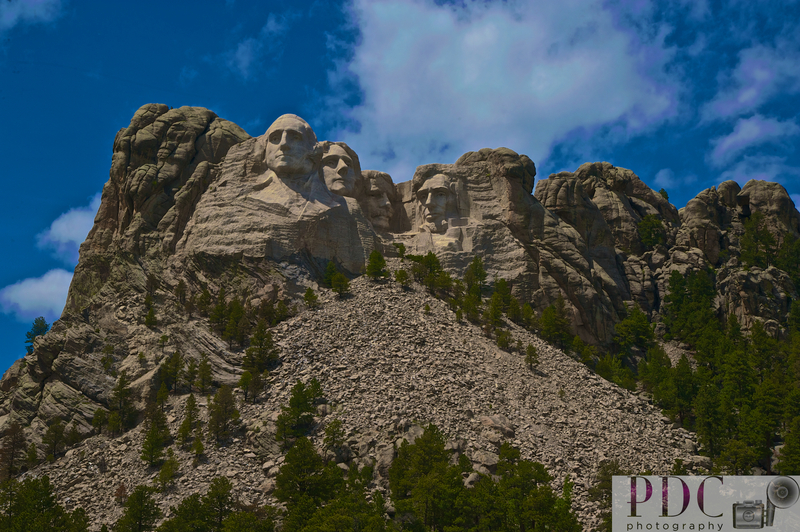 Finally, today we went to Mount Rushmore and Crazy Horse. Very awe inspiring. 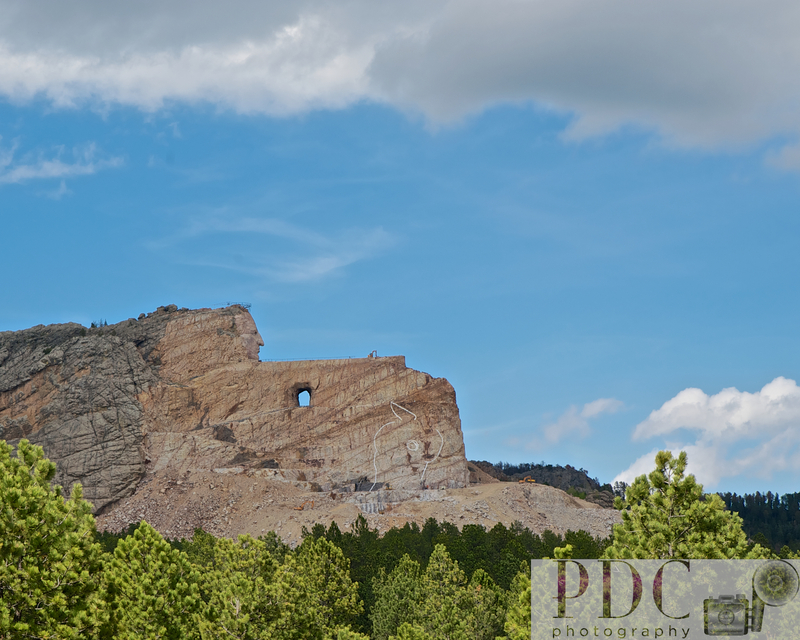 The Crazy Horse monument has been under construction for over 50 years. It is a massive structure. I will never see it in my lifetime, but I am glad to see the current progress. Tomorrow we are off to Colorado Springs, Colorado. I’m not sure that we will make it that far, but I am shooting for Cheyenne Wyoming and then see how I feel. I wish I’d pulled out of here today and parked in Rapid City. It would have put us about an hour and a half into our destination. My daughter is enjoying seeing the sites. Today is the 3rd day of my trip out west. I have logged over 900 miles in that time period. 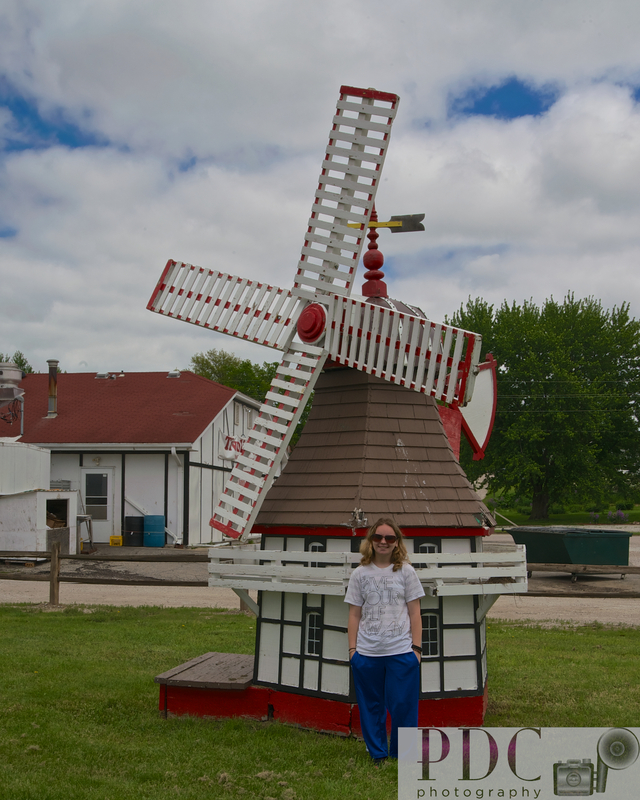 I attempted to post my blog last night at the KOA in Newton Iowa, but the WiFi was spotty at best and I kept losing connection to the server. There was not much excitement to report anyway, other than I had heard from my cousin Bruce in South Dakota and he asked me to come visit him. His sister (my cousin) Ruth is also visiting so it will be a mini family reunion! I left the KOA in Newton at about 10:30 in the morning thinking it would only take 4 – 5 hours to reach Bruce’s. I was hit about 1:30 with a case of the sleepys and had to pull off and rest a few! Then I started to think about all of the things I saw on the way…Bob Feller was born in Van Meter Iowa and there is a museum there. There are other notables we encountered, but Bob Feller stands out to me at the moment. Remember the “See Ruby Falls” and “See Rock City” signs that dot the landscape down through the Smokies. 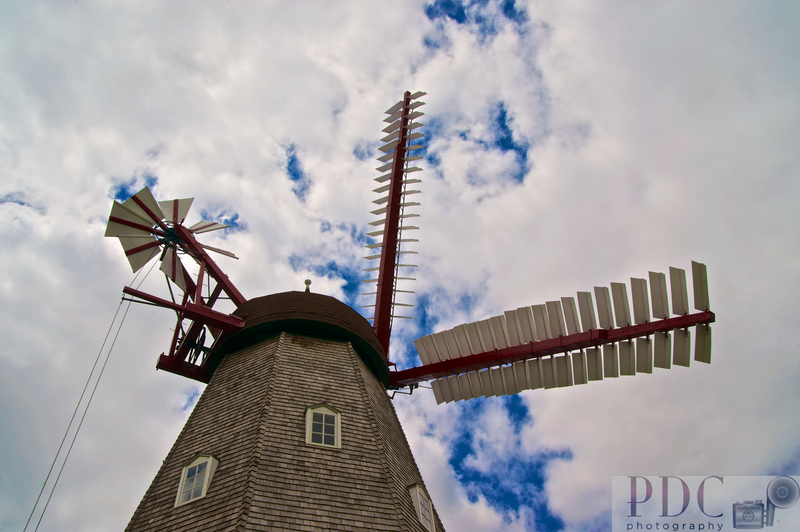 Well, I kept seeing the “Dutch Windmill at exit 65” sign and had to do it! 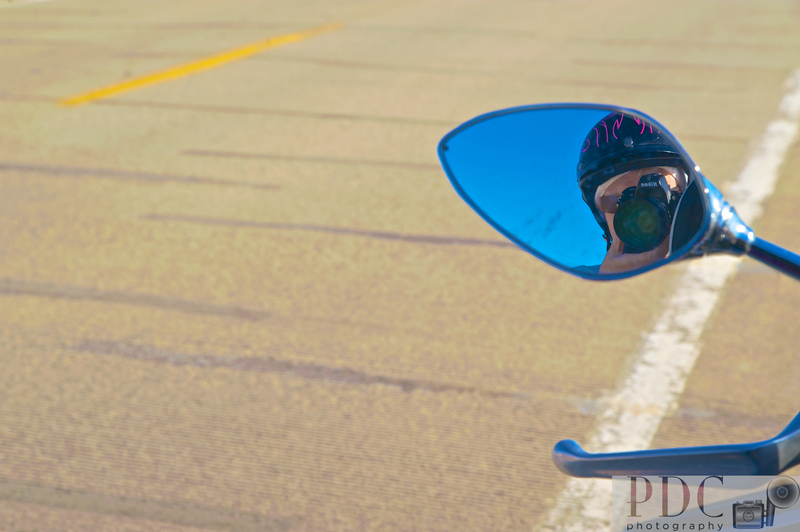 This was a cute diversion…Wish it had been out in a field somewhere instead of in the middle of Elk Horn, Iowa. It was a nice way to kill a little time and add a distraction to our day. We also stopped at one of those scenic overlooks. 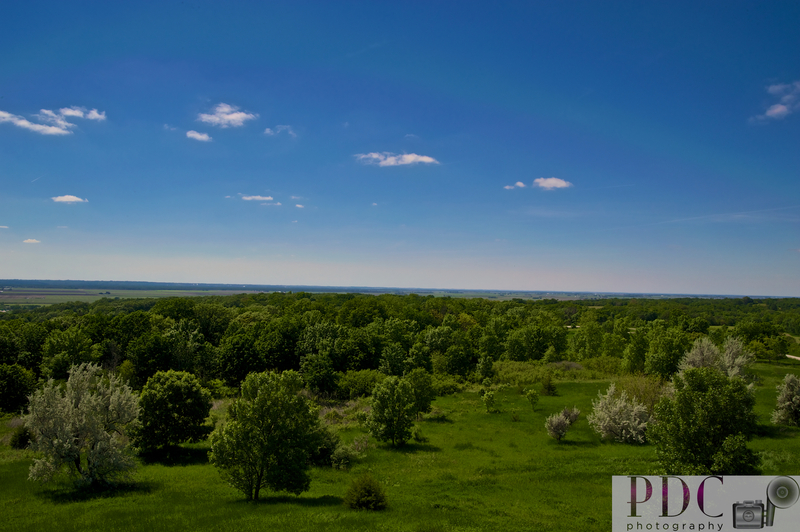 It had a tower you could climb to look out over the vast country. I love the sky here…it is so “big”! There are several turbine wind farms scattered across the country side. I do like seeing those; such a nice clean form of energy! 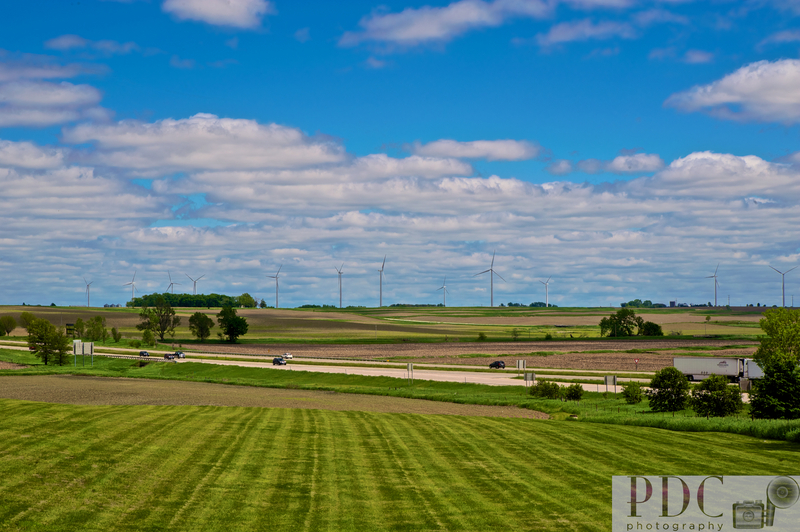 One final shot…This is from yesterday when we entered Iowa at Davenport. I had taken this on my phone but the one on my camera can give you a great perspective of how beautiful the sky and the land is out here. Thats all for now; I’m going to hang out with family for a couple of days and see the sites around here. Stay tuned! Life is an adventure…Life is what we make it…Go for the gusto! We say the clichés, but do we really mean them? I am going to test out those sayings and keep a positive outlook while on my “great trip out west”. I’ve always wanted to photograph the Grand Canyon, see the Badlands, visit the Petrified Forest, the Painted Desert, this summer I hope to make it to all of them. To every adventure there is always a beginning. About 6 years ago I told my daughter I’d take her to the Garden of the Gods in Colorado Springs, Colorado to do her senior pictures. It is one of those beautiful landmark places I enjoy visiting each time I go to Colorado. 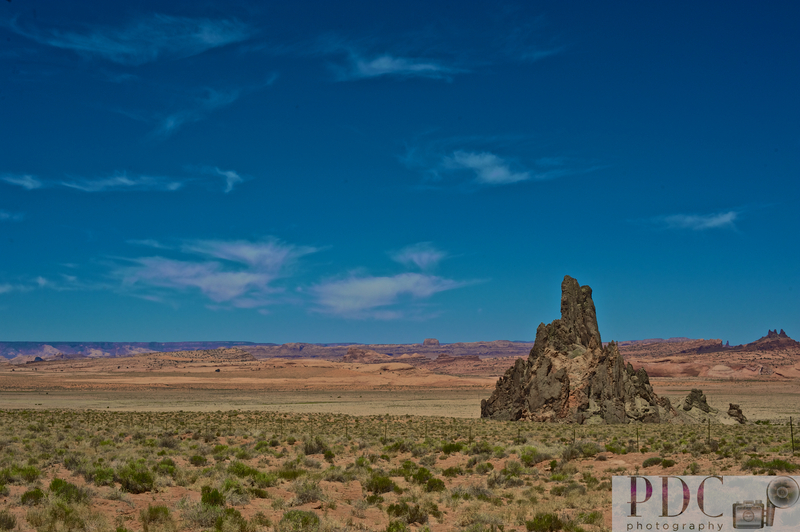 The red rock formations are absolutely breath taking! Fast forward to present day. 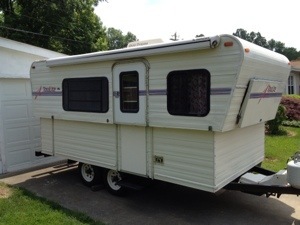 A week and a half ago I purchased a small, light-weight travel trailer called a Tow Lite…it is a 1994, so I knew it would have a few issues, but over a two week period I figured I could work out all the bugs and have the necessary repairs made to make it “livable”. The first thing on the agenda was to have the tires checked…it wasn’t going anywhere unless it was safe. All 4 tires were replaced…I took the camper on a “test camp-out” last weekend where I camped for several years and had the “seasoned professionals” give it the once over. I came home with a “new” battery, “new” refrigerator, and a working water heater. The valve was busted in the toilet so I took it to our local dealer for repairs. On my way out to the campground my awning came loose, but the guys locked and tied it for me. I asked them if I should just remove it, but they said since it was locked down it would be fine. I also asked the guys at the RV shop about it and it seemed it would not be an issue. I had a few other minor repairs and extra add-ons made to make my life easier. I packed my belongings and hit the road. It takes a little time to get up to speed, but I noticed that once I hit 55 or 60 it rides very smooth. My typical gas mileage of 24 – 25 mpg is now a paltry 15 – 16 mpg….I can deal with it. On the highway it does exceptionally well. I was worried about the turbulence from the semi’s, but It stays in place. I made it to Covington Kentucky…south of Cincinnati Ohio about 5:00pm and of course it was rush hour on a Friday evening and storming, so I decided it was time to enjoy dinner. I pulled off and put on my hazard lights and contemplated my next move. I pulled out my ratchets (Yes, I carry tools!) and started to work on the lock nuts holding it in place. The entire housing the awning “was” connected to had shattered, dry rotted I’m sure, and was hanging by the rope that had it locked into place. I took the lock nuts off the bolts and tried to disconnect the awning from the frame…mind you in the rain, wearing nice clothes and sandals! Many people drove past. I was able to disconnect the one side without an issue, but the other was wedged into place. I walked over to the car and pulled out my insurance card…thank you Alan Harner for roadside assistance for my RV and was going to make the call when a young man…a very young man pulled up in his little red sports car convertible and asked if I needed help. He would have made my day except for the bulge of smokeless tobacco in his jaw…eew! It was help and he was friendly. He was worried about damaging the awning…”aw shucks!” I told him not to worry about it. He was able to free the other side and he rolled it up, quite neatly for me. We started to load it into the camper and I told him I could raise it up to make it easier. 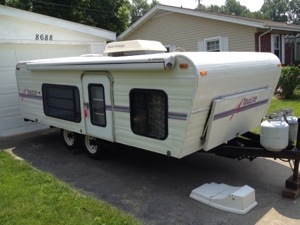 Being a Hi-Lo Travel Trailer, it raises up. His comment was “that’s nifty!” I secured the rest of the camper and on the road I went again. Being late and dark and having two dogs and my daughter with me, I exercised my rights tonight to spend the night in a Comfort Inn in Crawfordsville Indiana.